Junior Racers, every Saturday and Sunday, January 12th - February 17th (come out both days or just one which ever works with your schedule) For ages 6-16. $200 per skier. When kids reach the intermediate level, meaning that they know the basics, can ride the chairlift and can ski most of the runs at Bittersweet, they can progress to our Junior Racers program. This is the level at which kids show their greatest improvement because they are skiing regularly. Junior Racers can also get special buys on equipment through our ski shop. Junior Racers is intended to be a fun and educational improvement program for skiers 6 -16 years of age and intermediate skiing ability. 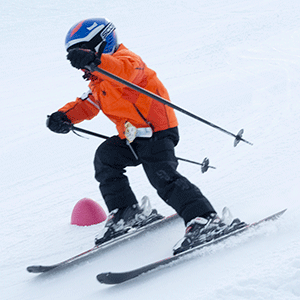 The program is designed to educate the skier on the "hows and whys" of racing. But most of all, the program allows Juniors to have fun and meet other skiers. Each racer will be given 2 complimentary NASTAR runs on Saturday and Sunday when the general NASTAR racer traffic allows. There is an awards party the last week of racing mom and dad won't want to miss. You can save some time by downloading a Junior Racers Application, filling it out, and bringing it with you to the Bittersweet Ski School. Questions? Please call 269-694-2820, ext. 4 or email the ski school if you have any questions. This program is the next step in racing for the Juniors. It is designed to improve your race skills as well as preparing you to become a serious racer. The program includes balance development, gate drills, course tactics, starts and finishes, slalom and giant slalom training plus individual and video analysis. Immediately after the base junior race program from 10 am - 12 pm, JDT skiers practice from 12 pm -1 pm Saturday and Sunday with the Junior Coaches. They will work exclusively on their racing skills. JDT members should be familiar with a race course and ski all hills at Bittersweet with confidence. Skiers will be evaluated and Coaches must approve skiers for participation in this part of the program. You can save some time by downloading a Junior Racers JDT form, filling it out, and bringing it with you to the Bittersweet Ski School. There are always teams looking for additional racers. Download an adult race form here!, and we'll get you on a team. We race every Tuesday night at 6:30pm, 6 racers on a team. "PRACTICE / FUN" night is Tuesday January 8th - otherwise, racing begins Tuesday, January 15th. Teams will be formed for people who do not have a sponsor. Each team should consist of six racers. Each night, the top four of the six times will count towards team score. Open to all skiers 21 years and older. Cost is only $60 (cheap!) per person. Discounted lift tickets may be purchased one hour prior to the race for only $15. Just show your race bib to the friendly person at the ticket window to receive your discount. If you can make it out for practice night on January 8th, 6:00 pm. you can sign up and practice running through the gates. Final signups and first night of racing starts Tuesday, January 15th, 6:00 pm. Bittersweet Ski School will set the race courses for intermediate skiing abilities. One course will be a slalom course and the other a modified open slalom. The course will be open for inspection 15 minutes before start time on race night. Racers may side-slip the course, but not ski through any gates prior to the race. All racers must have their first run completed within 45 minutes of start time, and both runs completed within 90 minutes. The running order will be random. Each racer is allowed two runs. You may run under your own bib number only. You can also download the Adult racing form here and bring it with you to the Ski School. Protests should be taken to race officials immediately and settled late in the bar over several beers. Remember, this is for fun!